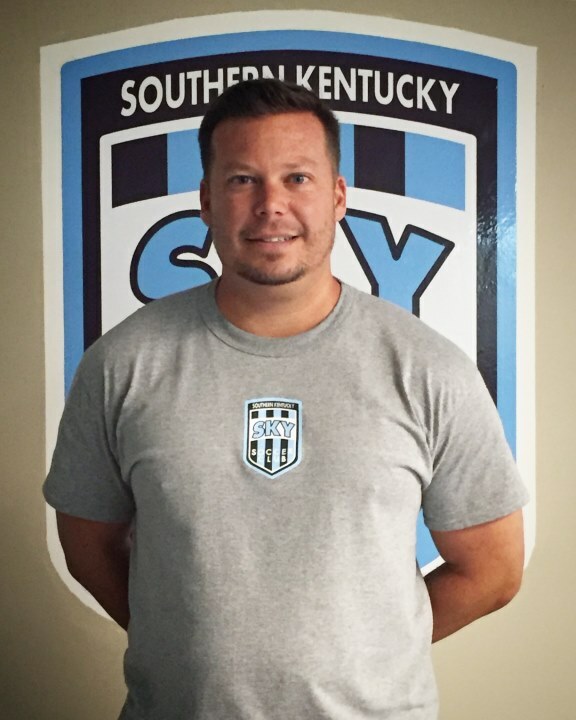 Evan Sutherland will serve as the Executive Director of Coaching for the SKY Soccer Program. He has been coaching the game for over 12 years and has done so at almost every level. The past 4 years he has spent time as a coach at Lexington FC and Madison Central High School (3 years). During his stint in Lexington, he won 2 state cups (2015-U18 Boys and 2014-U14 Boys), as well as state runner up in 2015 with U13 Girls. He captured several Midwest Regional League titles including 1 in 2015 as the winnerof the MRL Premier League with the U18 Boys. He took the U14 Boys from the FIrst Division. He has had success in winning multiple college showcase events including the Blu Chip College Showcase, Crossroads, and getting to the finals or final 4 of Disney, Jefferson Cup, ad Casl. Sutherland has coached multiple state ODP and regional pool players as well as developed many that have gone on to play and succeed at the college level. He also had success in 3 years at the high school level coaching at Madison Central High School. Over the past 2 years, the team went 35-9-2, won 2 district titles with a 10-0 record, and reached the Region 11 Semifinals. In 2015, Sutherland was nominated by his peers as a candidate for the KHSAA Coach of the Year. He coached several players that went on to be all state players. Sutherland spend previous time as an Assistant Coach at Georgetown College with the Men's and Women's Program. He also had 4 years as a Coaching Director where he helped evelop a coaching staff with 5 coaches that held A license or equivalent. The club won 3 state titles in his tensure and had several state runner ups, and semifinalists teams. Sutherland's Philosophy "My desire is to allow all players in the community to have an opportunity to learn and enjoy plaything the game. We have a unique culture in place inthe Bowling Green Community and I would like to utilize the diversity to help all of our kids achieve their goals. I want to be able to teach players how to play the game but also many life lessons that come with being a part of a team. Encouraging the freedom to play and express themselves but also being a great teammate, a coachable player, and a respectable student athlete. Growth and development will not come easy and a shortcut to success will not happen overnight. I've always told my players and parents to enjoy the adventure in its present form. We will look back on the past and remember the hard work and sacrifices we made to achieve our goals. Instilling the four pillars of the game (mental, physical, technical, and tactical) are the keys to the development of our players and the growth of the club." Evan holds the NSCAA Premier Coaching Diploma, the USSF National B LIcense, and the USSF National Youth License.